Galleon "Golden Hind". 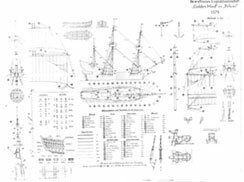 Ship model plans. 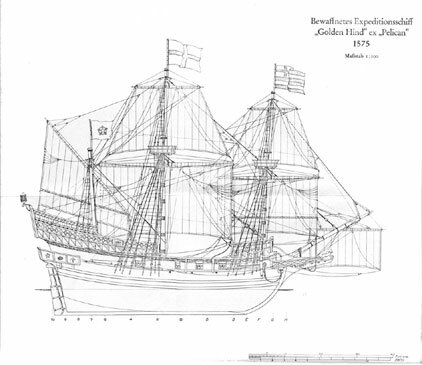 Francis Drake's 18-gun galleon "Golden Hind"
L/B/D: ca. 70 bp × 19 × 9 (21.3m × 5.8m × 2.7m). Tons: ca. 150 burden. Destined to become one of the greatest seamen of all time, Francis Drake made two voyages to the Spanish Main between 1566 and 1568 in company with his kinsman John Hawkins. Although lured by the profitable slave trade and South American silver, the Protestant Drake was further motivated by a fervent anti-Catholicism. His hatred increased after the loss of Jesus of Lübeck to Spanish duplicity at San Juan d'Ulua. In 1576, Queen Elizabeth approved, albeit secretly, Drake's captaincy of a mission with a threefold aim: to pass through the Strait of Magellan, reconnoiter the Pacific coast of South America, and, if possible, return via the Northwest Passage; to establish relations with people not yet subject to European princes; and to plunder Spanish shipping. Drake's command consisted of about 180 men in five ships. The flagship, Pelican, carried courses, topsails, and topgallants on her main and foremasts, and a lateen mizzen. The other ships were Elizabeth (80 tons, 16 guns) under John Winter; Marigold (30 tons, 16 guns) under John Thomas; Swan (50 tons, 5 guns) under John Chester; and Christopher (15 tons, 1 gun) under Tom Moone. After a false start in November, the expedition cleared Plymouth on December 13, 1577. After stopping at Mogador, Morocco, the crew sailed for the Cape Verde Islands, capturing half a dozen Spanish ships and, more important, the Portuguese pilot Nuño da Silva. His Santa Maria was renamed Mary and put under command first of Thomas Doughty, one of several "gentlemen adventurers" on the voyage, and then of Drake himself, who exchanged Pelican's command with Doughty. The latter proved a troublemaker and Drake soon relieved him of command altogether. The ships reached the coast of southern Brazil on April 5, proceeded from there to the River Plate, and then on to Puerto San Julian where they landed on June 20. The fleet remained at anchor for a month, during which the crisis with the mutinous Doughty came to a head. Tried on the spot, Doughty was found guilty and executed in the same place that Ferdinand Magellan had executed the treasonous Gaspar de Quesada in 1520. It was here, too, that Drake delivered his celebrated sermon enjoining the "gentlemen to haul and draw with the mariner, and the mariner with the gentlemen," in order to ensure their mutual success. After abandoning the other three ships, Pelican, Marigold, and Elizabeth put to sea on August 17. Three days later, they rounded the Cape of Virgins at the entrance to the Strait of Magellan where Drake rechristened his ship Golden Hind. The choice of name was political, for the golden hind was found on the coat of arms of Sir Christopher Hatton, one of the voyage's principal backers and a friend of the late Thomas Doughty. After only fourteen days in the strait, the English flag first flew in the Pacific on September 6, 1578. The ships' luck failed when a furious storm drove them southward, costing the expedition two ships. Marigold was lost with her 29 crew, and John Winter turned back to England. Drake, however, established that the Strait of Magellan did not separate South America from Terra Incognita Australis, as was then believed, but that its southern shore was made up of islands to the south of which lay open ocean, now known as Drake Passage. When the storm abated, the English struck north along the unsuspecting west coast of Spanish America. Looting the small port of Valparaiso on December 5, they pressed on to Arica, where silver from the mines of Potosí was shipped to Panama. When Golden Hind arrived at Callao on February 15, word of the English presence had preceded them, although there was little the Spanish could do to detain them. Learning that a treasure ship had sailed only three days before, Drake took off in pursuit and on March 1 captured Nuestra Señora de la Concepciónnicknamed the Cacafuegooff Cape Francisco, Colombia. Sailing out of the main coastal shipping lane, the English transshipped 80 pounds of gold and 26 tons of silver bars equal in value to about £126,000or about half the English Crown's revenues for a year. Although chiefly interested in returning home with their treasure intact, the English captured a few more ships whose crews were almost unanimous in their respect for Drake's gentility and fairness. Their greatest concern was over his drawings of the coastline, which seemed to suggest that more English would follow, "for everything is depicted so naturally that anyone who uses these paintings as a guide cannot possibly go astray." In searching for the Strait of Anian, or Northwest Passage, Drake sailed as far as 48°Njust south of the Strait of Juan de Fucabefore turning south. On June 17, 1579, Golden Hind anchored in 38°30N at a "convenient and fit harbor" generally thought to be Drake's Bay, on Point Reyes, California, just north of San Francisco Bay. Drake's dealings with the natives were characteristically evenhanded, and the English found "a goodly countrye, and fruitfull soyle, stored with many blessings fit for the use of man"fit even to be called New Albion and claimed for his majesty. On July 25, Golden Hind sailed west across the Pacific, making no landfall until September 30, when she landed in either the Palau or Ladrones Islands. By October 16 she was off Mindanao in the Philippines, from where she turned south for the Moluccas. The king of Ternate had recently thrown out the Portuguese, but he allowed Drake to load spices and refit. After a month preparing for the last leg of their journey home, the expedition sailed on December 12 but spent a month caught in the maze of islands and shoals in the Indonesian archipelago. On January 9, Golden Hind struck a coral reef and was held fast for a day before the wind shifted and she slid into deep water. After watering his ship at Tjilatjap on the south coast of Java (previously thought to be connected to Terra Australis), Drake weighed anchor on March 26. A nonstop journey of over 9,700 milesremarkable for its lack of incidentbrought Golden Hind to Sierra Leone on July 22. The first English circumnavigation of the globe ended on September 26, 1580, when Golden Hind sailed into Plymouth after a voyage of 2 years, 10 months, and 18 days with 59 of her crew aboard, a great achievement given the record of many later voyages. Cautioned to lie low while the diplomatic consequences of his voyage were considered at London, Drake was finally received by Queen Elizabeth. On April 4, 1581, Drake was knighted on the decks of Golden Hind at Deptford. Elizabeth also ordered the ship displayed in dry-dock, and the intrepid ship remained on public view until the 1660s. Hampden, Francis Drake Privateer. Sugden, Sir Francis Drake. Copyright © 2004 Best Scale Models. All rights reserved.